Hawaiian party food ideas are a fun way to get that tropical feel for your luau or island themed event. 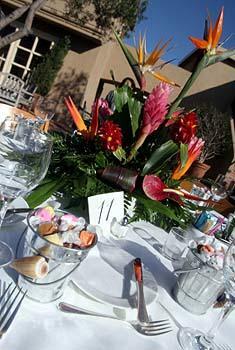 With some orchids and Hawaiian shirts along with a great menu, you can have a festive and colorful get together. A couple of bowls of poi can add an authentic flavor to your party. If you are busy sending out the invitations and buying leis, you may not have the time to grind the taro root to make poi so you may want to order it from an online source. It may seem a bit strange at first, but as a side dish it will compliment all your other Hawaiian party food ideas. Break out the grill and fire up the coals. A bit of Huli Huli on each plate is a sure way to make your guests happy. Mix all the ingredients together until thoroughly incorporated. Place the chicken on the grill, turning and basting with sauce until it is done. Another good Hawaiian party food idea is the extremely popular Adobo. This dish originated in the Philippines but has since been adopted by Hawaiians. Add a little olive oil to a pot and brown the onions and garlic. Add the water and vinegar to the onions and garlic and bring to a simmer. Add the pork and balsamic vinegar and continue to simmer for 10 minutes. Add the soy sauce and simmer for another 10 minutes. Remove the meat from the sauce and brown it in a separate pan with the paprika. Mix the 2 tablespoons of water with 2 tablespoons of cornstarch to make a slurry and thicken the sauce with it. Adobo is usually served with rice. Here's a fairly simple sandwich wrap that makes a great party finger food. Dice the chicken and place in a large bowl. Add the rice and pineapple and stir thoroughly. Place 1 tablespoon of salsa on each of the tortillas and spread to 1-inch from the edges. Top with chicken down the middle of the tortillas and roll up. Use a toothpick to hold wrap closed if necessary. If you like Pina Coladas or Mai Tais, your Hawaiian party food ideas are definitely headed in the right direction. Combine ingredients in a blender or mix well and enjoy on the rocks. Garnish with a cherry and pineapple. Your local party supply store should be able to provide you with everything you need to have a successful Hawaiian party. Then you just need to send out the invitations and pick up some tropical party favors, and your Hawaiian party food will guarantee a great party.